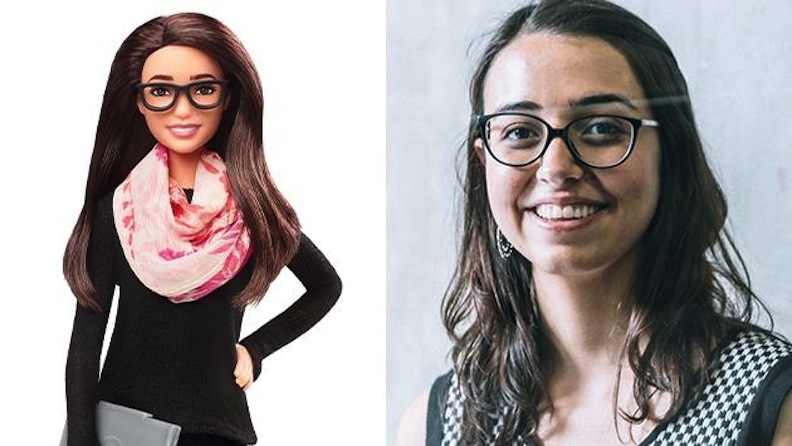 Tech dynamo Mariana Costa Checa is one of the diverse Shero dolls for 2019. The Peruvian visionary is leading the way for women in her field. The number of women who became Shero dolls for 2019 is quite revelatory. 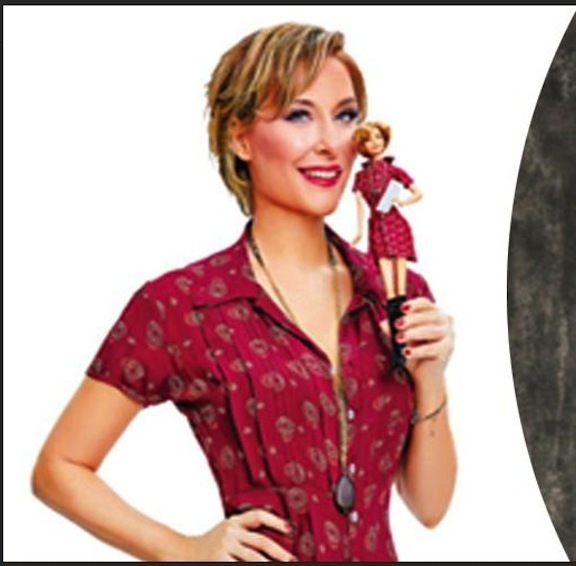 Rather than releasing a slim handful or a half-dozen dolls, Mattel went all out and unveiled 19 breathtaking, realistic dolls for March, the month of International Women’s Day. 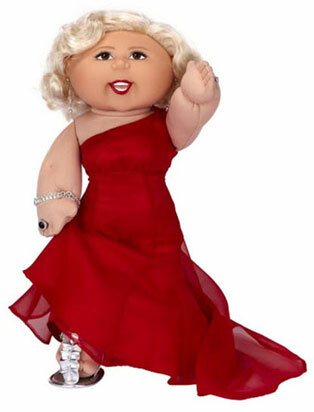 Mattel was very calculating with their decision to debut the dolls in March. They tied it into the 60th anniversary of Barbie and the cyber celebration of IWD. The Internet was alive with the sounds of muses — women were honored everywhere for how they’ve impacted the world of theater, journalism, business, science, and the arts. In a prior blog, I spotlighted the high-jumping, hard-serving Shero dolls for 2019 that were athletes and other action-driven professionals. This week’s blog focuses on the women who are artistic, active, authoritative, and definitely self-described activists. In a world where women are slightly more than half the population, and are said to “hold up half the sky,” Mattel is wise to honor the women who are fighting and toiling to be acknowledged as self-directed citizens. Mariana Costa Checa is a Latin American entrepreneur from Peru who is redefining what tech means and why it is meaningful in a 21st-century environment. Along with her husband, Herman, Mariana is a cofounder of Laboratoria, which is a startup company that prepares women to pursue careers in the high-tech field. 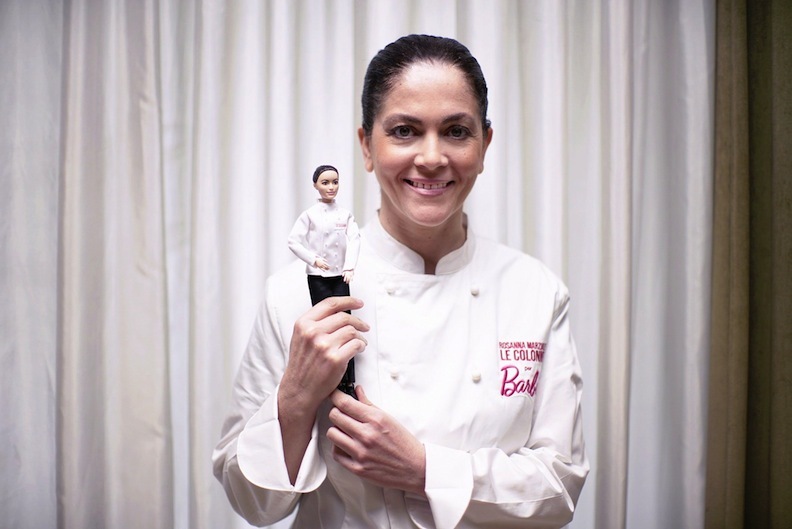 The BBC has profiled Mariana and has named her one of the world’s “Most Influential Women.” It’s not surprising, then, that Mattel chose her as a Shero doll for 2019. The mother of a 2-year-old child, Lucia, Mariana is a new breed of entrepreneur: smart, capable, professional, maternal, and devoted to advancing women in a onetime male-dominated realm. She has linked her active interest in social justice with gainful employment. Eleni Antoniadou hails from Greece, and she shares a love for Latin America with fellow Shero doll Mariana Costa Checa. Antoniadou is a scientist who has made great strides in the field of regenerative medicine and bioastronautics. While volunteering in Latin America as a medical doctor, Antoniadou decided to dedicate a portion of her working life to altruism and doing for others. Her work ethic and her ethical approach to life combined to make her an ideal Shero doll for 2019. In 2012, Antoniadou joined NASA, fulfilling a childhood dream, and her time with the space agency proved that she could do anything. That personal mantra mirrors Barbie and Mattel’s girl-centric slogan. In her scientific career, Antoniadou follows a dual direction. She is a pioneer in stem cell therapies to regenerate body parts and also spearheads 3D bioprinting for space applications. This 2019 Shero doll pays tribute to the brilliant mind and beautiful heart of a scientific woman. 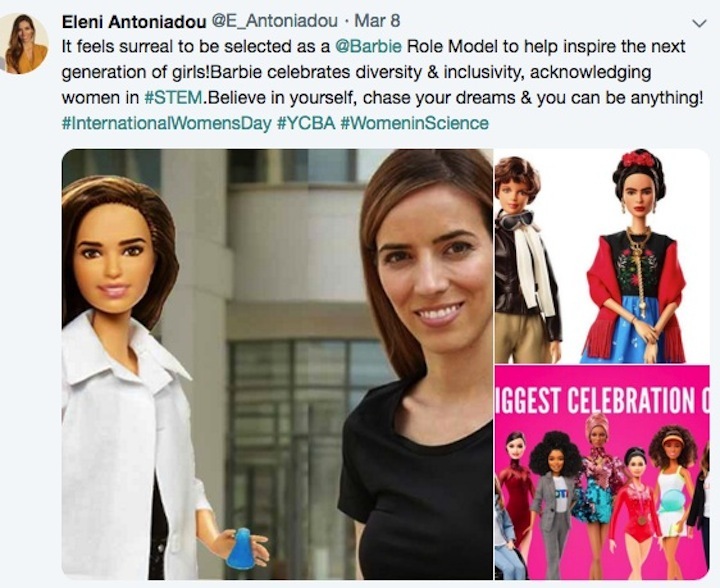 Antoniadou is a relentless crusader against organ harvesting/trafficking and a vocal advocate for recruiting girls to join the ranks of STEM professionals. She actively raises awareness for the need for legal organ donations, and hopes that the news of her doll likeness “will inspire other girls and women to follow in” her path. Interestingly, even though women rule the kitchens in homes around the globe, men dominate as head chefs in restaurants and commercial kitchens worldwide. An up-and-coming generation of female chefs is cooking up their own delicious destinies, and Rosanna Marziale is one of these very capable cuisine mavens. Labeled the “Queen of Mozzarella” because of her deep affection for that cheese, Marziale is considered the go-to face for new Southern Italian cuisine. The author of two children’s books, as well as a recipe book that elevates the use of mozzarella, Marziale is a flavorful Shero doll for 2019. She is the head chef at Le Colonne restaurant, where she earned a Michelin star in 2013, but she also dreams of producing a cartoon series for children. In her animated film, all the characters would be made of food. Marziale is an accomplished chef and a woman who has earned applause and acclaim. Despite her achievements, she still challenges herself to do more. She wants to do everything! Perhaps if Rosanna Marziale does begin to pursue her film career, she will go to fellow Shero doll candidate Lisa Azuelos. An award-winning filmmaker, Azuelos represents France and the important role that women can and should play behind the camera. 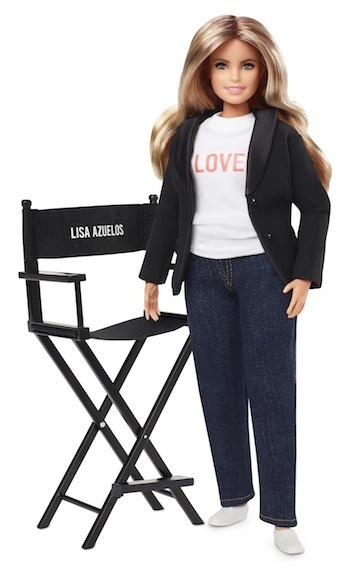 Mattel chose Azuelos as a Shero doll for 2019 because they were impressed by her cinematic résumé and her female activism. An outspoken supporter of empowering more women in the movie business, Azuelos is the president of the Yolove foundation. Through this charitable arm, she raises funds and awareness of the need to ensure women’s rights around the world. Azuelos has written, produced, and directed films in both English and in French. 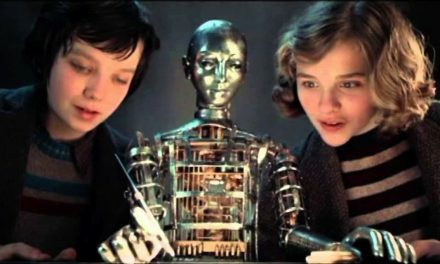 Her movie “LOL” was made in a French version, starring Sophie Marceau and Christa Theret, and an American version with Demi Moore and Miley Cyrus. The 2019 Shero committee also honored another trailblazer in the realm of film production and screenwriting. Turkey’s Gülse Birsel has never met an adventure that she didn’t like. 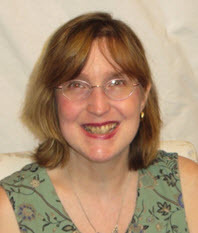 The author and actress is comfortable in front of the camera lens and behind a computer laptop. She has gained a huge following for her work as an actress on the TV show “g.a.g.” and has leapt to the big screen as a movie star and screenwriter. Her feature film debut, “Aile Arasinda,” was the fulfillment of a lifelong dream—and Birsel never stops dreaming. She has fearlessly tackled magazines (climbed to editor in chief of Esquire and Harper’s Bazaar) and has written six books. They were all bestsellers. Whether she was filing a newspaper column or finding her niche in a weekly TV series, Birsel has made her mark on Turkish culture. It’s no wonder that she is a Shero for 2019. In fact, many of the Shero dolls for 2019 can boast about their connections to television, book publishing, and magazine/newspaper columns. It makes sense that many of the 2019 Shero dolls are all about getting their voices heard, their thoughts understood, and their beliefs elevated to professional principles. Since Mattel is dedicated to helping eradicate the Dream Gap, it is extremely smart that they have handpicked Sheroes who embody that confidence to speak and know their own minds. 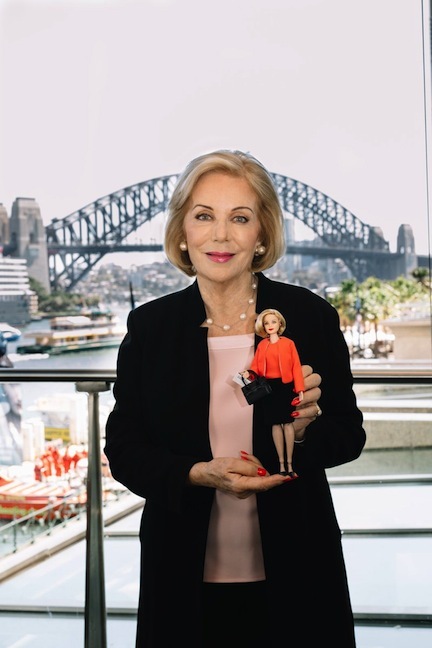 Journalist and editor Ita Buttrose is the author of 11 books and is a tireless advocate for improving her community and the welfare of her fellow men and women. The Australian newswoman became the first woman to ever edit a major metropolitan newspaper in Australia when she accepted the top post at Sydney’s Daily Telegraph and Sunday Telegraph. Japan’s Tetsuko Kuroyanagi is an author, an actress, and a UNICEF Goodwill Ambassador. Considered a national treasure in her home country, Kuroyanagi has been a staple on Japanese TV for more than 40 years. Her TV show “Tetsuko’s Room” is a must-watch program, and one of her novels, “Totto-Chan: The Little Girl at the Window” has sold more than 8 million copies in Japan. It has been translated into multiple languages and has been sold in more than 35 other nations. A philanthropist, Kuroyanagi used the royalties from her hit book to launch the Totto Foundation. It is a charitable organization that provides training for actors with hearing limitations. A trained singer, Kuroyanagi is not stranger to being made into a doll of sorts. 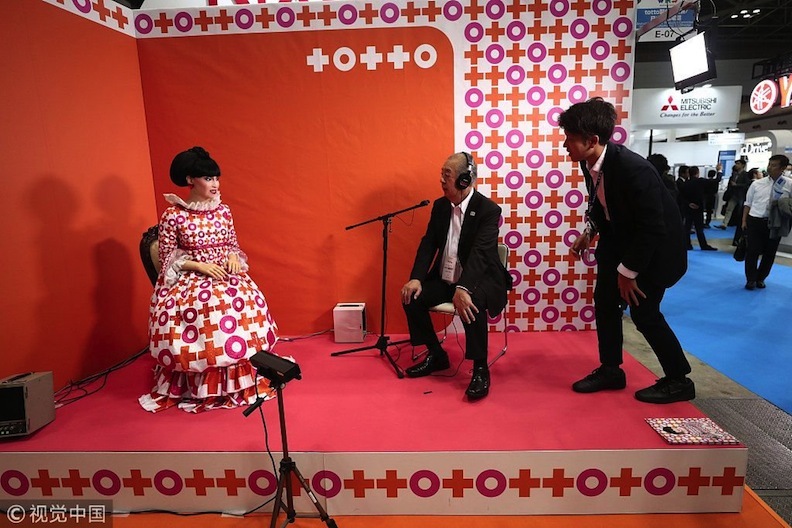 Besides becoming a Shero doll for 2019, she was also made into a lifelike robot for the World Robot Summit. The Japanese talk-show host is as beloved, imitated, and followed as America’s Oprah Winfrey. The Shero dolls for 2019 are certainly an eclectic group, reflecting a myriad assortment of ages, ethnic backgrounds, cultures, and cultural significance. China’s visual artist Chen Man is both an artist and an entrepreneur. Chen has been credited with rebranding how fashion photography looks in China. She has brought a keen intellect and a sophisticated palette to how she composes her fashion shoots. In addition to her photographs, Chen has cofounded Vnision, an Internet company that specializes in photography apps. One of her creations is Bigshot. Chen has also been named as a “Young Global Leader” by the World Economic Forum. Her selection as a Shero doll for 2019 is just another inevitable step in her forward-looking journey. China’s fashion industry has been deeply impacted by this Shero doll for 2019. Chen Man has broken barriers and changed the standard of what defines beauty. While Chen Man has made a name for herself behind the camera, England’s Adwoa Aboah is all about striking a pose and striking a blow for women’s rights. Aboah has walked runways for Chanel, Versace, and Dior. She’s starred in fashion layouts and has graced the cover of dozens of international magazines. She is a sought-after supermodel for Vogue, Dazed, Love, and i-D magazine. Besides modeling, Aboah has honed her craft as a contributing editor for British Vogue magazine. She’s also launched a judgment-free cyber space called Gurls Talk. It’s an online community where girls from around the globe can connect, chat, support one another, and share life’s experiences. 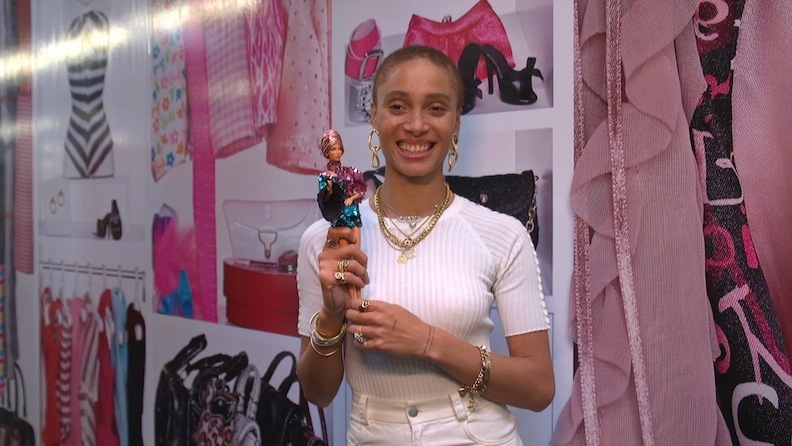 Quite fittingly, Aboah is a hero in real life, and a Shero doll for 2019. 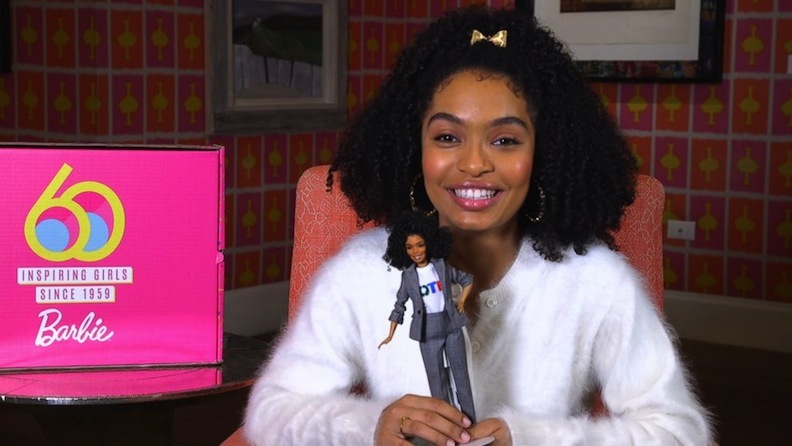 Finally, the last Shero doll for 2019 is the American actress and model Yara Shahidi. Gaining popularity and a fan base on the TV sitcom “Black-ish,” Shahidi became a breakout star. She received so much fan mail and positive word of mouth that her character was given her own spinoff series, “Grown-ish.” TIME magazine has dubbed her one of the world’s “30 Most Influential Teens,” and FORBES included her on their “30 Under 30” list in both 2017 and 2018. Shahidi gained these honors for her prolific work as a humanitarian, activist, and social influencer. The NAACP has given their Image Award for Outstanding Supporting Actress to Shahidi, and she has also scored a Gracie Award for her comedic acting. When she’s not learning lines and hitting her mark, Shahidi is determined to make a mark in the world around her. Shahidi has served as a spokesperson for DoSomething, an online digital organization that calls for off-line action; has pitched in for 3M’s STEM campaign, raising money for science-and-tech classes in American schools; and has been a consultant for the Obama administration’s initiative on STEM advancement. On her own, Shahidi launched Eighteen X 18, which was a platform to both educate and turn out first-time voters for 2018’s midterm elections. That civic-mindedness is why Mattel chose to dress her Shero doll for 2019 in a VOTE T-shirt. 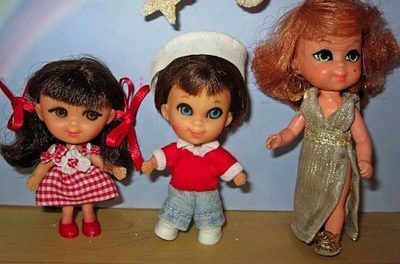 Show and Tell: TV dolls say a lot about characters, collectors, and culture. 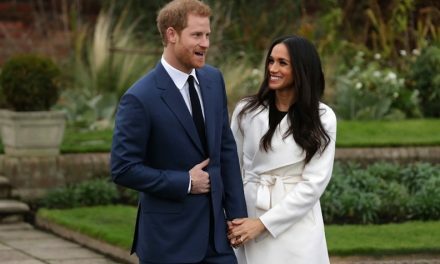 Meghan Mania: Which doll will be first in the new Royal Wedding race?